To pin a cloth to a body so it would hang like a cape or a curtain, use a particles joint. Cloth body greatly enhances the appearance of dressed characters (otherwise entirely animated) and saves the time of game artists. However, simulation of this type of body is quite costly and it is strongly recommended to use distance optimization to avoid performance hits. Cloth body can be assigned only to dynamic mesh objects. An example illustrating the use of cloth body and particles joint. In most cases, it is important that polygon triangulation of the mesh, for which cloth body is generated, is as illustrated! Otherwise, it may not stretch properly and evenly in all directions. 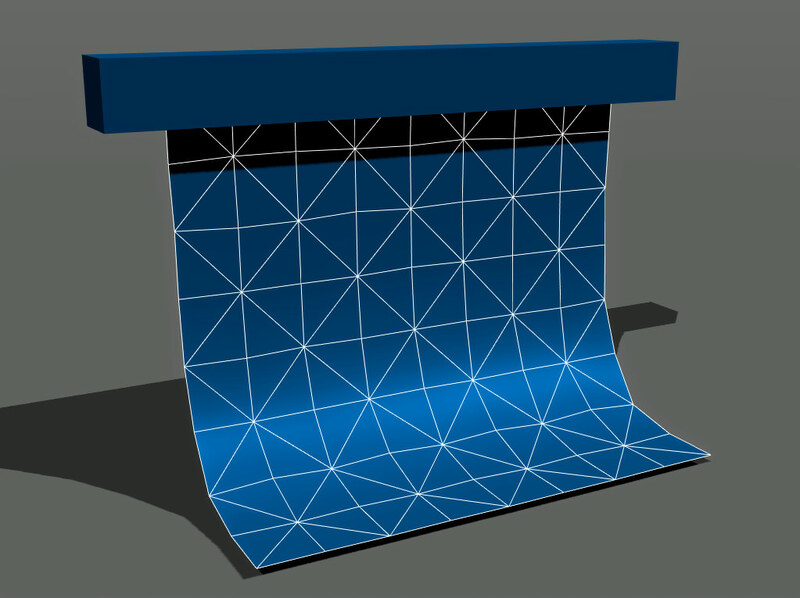 For example, in 3ds Max mesh topology needs to be edited manually: choose Modify panel > Selection > Edit Edges rollout and click Turn to turn the triangles in a poly. A cloth body is modeled as set of point masses (particles) located in the mesh vertices. Each particle is represented with a sphere shape and is linked together with other particles by inner spring joints that are located along the mesh edges. Inner joints allow to recreate mesh topology, on the one hand, and constrain stretching and folding, on the other. Each particle is characterized by a position, mass and velocity and has a constant spherical shape with a set radius. The total mass of the whole body is equally distributed among them. In accordance with Newton's second law particles can be acted upon by a force or an impulse applied by inner joints and external forces (collision, gravity, air resistance, wind, etc.). Cloth particles use continuous collision detection, so higher values are preferable for more robust behavior. Collisions between the particles are not calculated and should not be considered when setting a radius. Be careful, however, as particles too big in diameter can provide incorrect interaction with environment (twitching or blowing up of the cloth). Too low radius results in poor collision handling. As cloth particles are approximated with spheres, the cloth never lies flat on the ground or tightly adheres to the surfaces. There is always some gap that corresponds in size to set radius. An object can pass through the cloth, when the particle radius is small and the cloth is stretched. The reason is that continuous collision detection is performed only for particle spheres located in vertices of cloth mesh. The number of iterations controls the accuracy of the solution of cloth inner joints. This number indicates how many times the joints are solved per physics frame. Joints are solved in a random order to provide more predictable stretching results. Low number of iterations results in faster simulation. However, in this case the cloth is more prone to stretching and looks more elastic. The minimum value is 1. High number of iterations provides more accurate solution of constraints. In this case the cloth lookes stiffer. The maximum value is 16. Increased number of iterations is considerably expensive and at some point ceases to bring a noticeable benefit, so it should be kept within a reasonable cost-effectiveness limit. Increasing the number of iterations may help to avoid twitching of a cloth. With these types of constraints, it is possible to obtain the desired look and feel of the cloth and simulate a variety of different deformable materials ranging from a stiff carton to soft lycra. By the maximum value of 1, the particles spring back with great force and the cloth is hard to stretch. It gives the effect of stiff non-stretch cloth, e.g. linen or tweed.. The lower the value, the easier the particles are moved away from each other and the more stretchable and elastic the cloth is, e.g. nylon or spandex. 0 and near zero values are not allowed because they cause unstable simulation and blowing up of the cloth. By the maximum value of 1, the angles tend to be retained and the cloth resists folding. The cloth appears to be stiff and wrinkle-free (for example, paper). The maximum value may provide unsteady behavior. By the minimum value of 0, the cloth can be easily folded and bent in any direction, regardless of the original topology of the mesh. Set linear restitution to 1. Increase the number of joints solver iterations. Use the mesh with fewer vertices. Rigidity parameter is an additional constraint of the cloth motion to make it stiffer and more inflexible. For that purpose, linear and angular velocities of each cloth particle are corrected according to the total velocities interpolated for all the particles. The minimum value of 0, makes the cloth elastic, flexible and easily deformable. The maximum value of 1, makes the cloth stiffer and less prone to deformation. When the cloth is stretched beyond its elastic limit or folded, it tears and shreds into pieces. Tearing is caused by applying the force or collision with a physical body, and depends on the cloth stiffness (controlled by linear and angular restitution parameters). For example, imagine the cannonball hitting the sail and leaving the hole in it. The cloth is torn only along the edges of cloth triangles, splitting mesh vertices and duplicating particles. If torn pieces of cloth fall onto one plane, they cause z-fighting. Linear threshold sets the distance limit for stretching the cloth. When two particles move away from each other further than this limit, joints that connect them break and the tear appears. If set to infinity (inf), the cloth is stretched without tearing. This value is set by default. Same as linear threshold, angular threshold represents a maximum angle to fold the cloth relative to its initial state. If cloth triangles are bent any further, the joint breaks and triangles are separated along the adjacent edge. If set to infinity (inf), the cloth is folded without tearing. This value is set by default. It is recommended to keep the angular threshold lower or equal to 180 degrees. To improve performance and avoid the excessive load, simulation of the cloth can be limited to the specified distance. When the player is out of this area, the cloth stops to be updated and freezes statically. Pin joints also become inactive and cease to attach pinned bodies. If set to infinity (inf), there is no distant-dependent optimization for cloth. This value is set by default. If distant-dependent optimization is used, cloth body should be attached only to static bodies. Otherwise, it may cause visually incorrect behavior, such as cloth cloak hanging in the air or attached bodies fall loose due to gravity. In case of attaching a cloth to dynamic objects, use Physics distance. Select a dynamic mesh object to assign a cloth body to. Go to the Physics tab in the Parameters window and assign a physical body to the selected object by selecting Body -> Cloth. To attach a cloth to a body use a particles joint. In case of rigid bodies (either static or dynamic) and dummy bodies, pinned particles stay fixed in their position and follow transformations of attached objects pulling the cloth with it. Adjust the pinning area using threshold and size parameters of the particles joint. To ensure stable simulation it is important to set appropriate masses of the cloth and the attached body. Unbalanced masses may cause twitching of cloth joints. Convincing simulation of the clothing on a skinned character requires a different approach. To follow bones transformations, each vertex of the cloth that is found in the particles joint area is mapped to the nearest skinned mesh vertex (up to the distance specified by the Threshold parameter of the particles joint). It is not recommended to attach the cloth directly to the skinned character, because difference in topologies may result in visual artifacts. Instead of it, it is better to create an identical cloth surface on the skinned mesh character, make it invisible and attach a physical cloth to it. 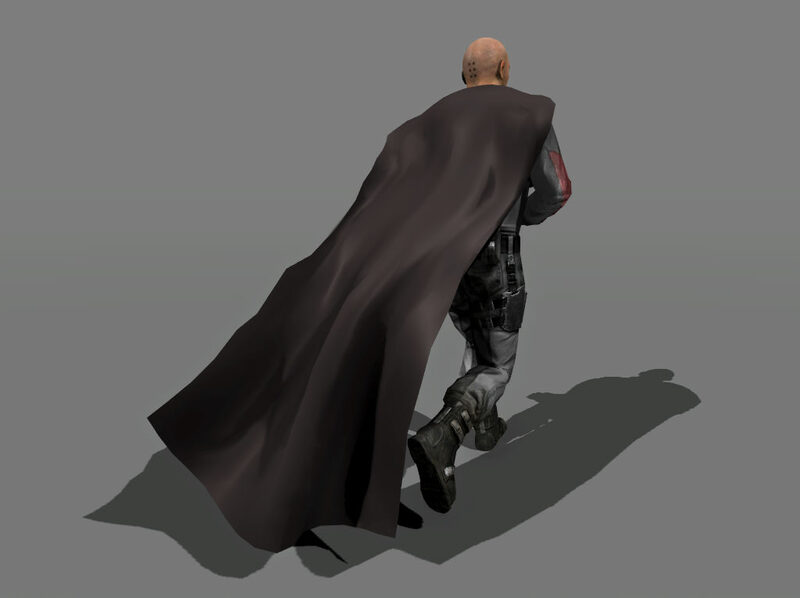 When creating a skinned mesh, add a cape surface identical to the cape that the character would wear. It can be either a whole cape, or only its clipped part that needs to be pinned. The latter is preferable when complex clothing is simulated, which requires more flexible control over which parts to simulate physically and which ones to move with skinned character. In our case, it's cloth part over the shoulders. Add skinned mesh that has a ragdoll body assigned. Make sure that the cape surface is enabled. Add a separate dynamic cloth mesh and synchronize its position with skinned character. 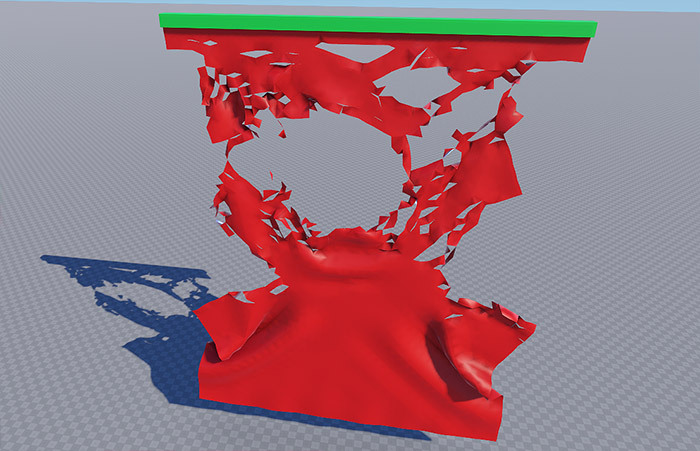 Turn off physical simulation (CTRL + SPACE) and assign a cloth body. Attach cloth body to ragdoll body. If the Threshold distance of the particles joint is set low enough, the physical cape will be automatically attached only to the cape surface (i.e. shoulders). After that, the cape surface is simply disabled and does not provide any load at all.